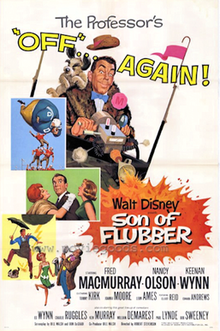 Son of Flubber is the 1963 sequel to the Disney science fiction comedy film The Absent-Minded Professor (1961). Both films star Fred MacMurray as a scientist who has perfected a high-bouncing substance, Flubber ("flying rubber") that can levitate an automobile and cause athletes to bounce into the sky. The film co-stars Nancy Olson and Keenan Wynn, and was directed by Robert Stevenson. Many of the cast members from The Absent-Minded Professor also appear in the film, including Elliott Reid and Tommy Kirk. The film was shot in black and white, but a colorized version was released on VHS in 1997. Professor Ned Brainard's discovery of Flubber has not quite brought him or his college the riches he thought. The Pentagon has declared his discovery to be top secret and the IRS has slapped him with a huge tax bill, even if he has yet to receive a cent. He thinks he may have found the solution in the form of "Flubbergas," (the "son" of Flubber) which can change the weather. His wife Betsy becomes fed up with all the stress and starts separating from him, and the professor's old rival Shelby starts trying to woo her again. Brainard's experiments continue, by making it rain inside people's houses, as well as in Shelby's car too while he's driving, which causes him to get into an accident with a police car. It also helps Medfield College's football team to win a game, but it also has one unfortunate side effect: It shatters glass, which eventually places Brainard on the lam from Alonzo P. Hawk, who is planning to close Medfield College, and whose insurance company must pay the claims for the broken glass, traces the damage to Ned and threatens legal action (After Ned rejects his offer to become partners in a glass company scam, hoping to use the money to save Medfield College). At home, his wife Betsy is jealous of the attention lavished on him by an old high school girlfriend setup by Shelby to get his hands on Betsy, but she dumps him after Ned is arrested. On trial, Ned's future seems hopeless as he is faced with the damage lawsuit, and a Prosecutor asking Ned if he would return to his classroom. Until the county agricultural extension agent (Ed Wynn) shows the court that his crops grew extra large because of Ned's experiment, which the agent names "Dry Rain", and the professor is acquitted, and he and Betsy are reunited. Driving in their flying car, Betsy said she is crazy about science to Ned, and soon they share a kiss. In the last scene, the football-filled with flubber gas flies into outer space. Plans to make a sequel to The Absent-Minded Professor were announced in November 1961. According to Walt Disney's daughter, her father (who abhorred sequels) made the film only because there were unused gags from The Absent-Minded Professor. The football game was filmed on a field constructed in a studio, with players suspended by wires. Medfield College, which was also the setting for the earlier film The Absent-Minded Professor, was later used for a trilogy of Disney's "Dexter Riley" films: The Computer Wore Tennis Shoes (1969), Now You See Him, Now You Don't (1972), and The Strongest Man in the World (1975), each starring Kurt Russell and Cesar Romero. Son of Flubber was a critical and commercial success. It grossed $22,129,412 at the box office, earning $7.1 million in theatrical rentals, making it the 7th highest-grossing film of 1963. The film currently holds an 86% "Fresh" rating on the review aggregate website Rotten Tomatoes. Bosley Crowther of The New York Times wrote, "It is crazy, of course, in the spirit of old-fashioned sight-gag slapstick farce, but it is fun—and, indeed, a bit of a satire on the weird inventions of the new atomic age." Variety opined that the film "doesn't fill its father's footprints" and "lacks the ingenuity, clarity and neatness of its memorable progenitor. Fortunately, though, individual scenes within the less effective whole have the same uproarious, bellylaugh quality that characterized the original." Philip K. Scheuer of the Los Angeles Times wrote, "Since I had no laugh-o-meter handy I was unable to clock the yocks but I am sure 'Son of Flubber' will hold its own against 'The Absent-Minded Professor' and 'Bon Voyage.'" The Monthly Film Bulletin thought that the film "strains too hard to repeat the success of its predecessor, The Absent-Minded Professor, and is further weighed down by some unnecessary complications presented with little wit or sparkle. But the slapstick is generally as inventive as before, taking in a delightful spoof commercial for flubber and some excellent special effects when Professor Brainard launches his home-made clouds and his flubberised football player." ^ a b Box Office Information for Son of Flubber. The Numbers. Retrieved September 5, 2013. ^ MacMurray Set in 'Professor' Sequel: Disney Film About King Arthur; Peter Finch and Wife Co-star Hopper, Hedda. Los Angeles Times (1923-Current File) [Los Angeles, Calif] 04 Nov 1961: B6. ^ DISNEY IMPROVES ON FLYING TACKLE: Football Players Soar in the Air in 'Son of Flubber' By BOSLEY CROWTHER Special to The New York Times.. New York Times (1923-Current file) [New York, N.Y] 05 May 1962: 18. ^ "All-Time Top Grossers", Variety, 6 January 1965 p 39. Please note this figure is rentals accruing to distributors not total gross. ^ Film reviews for Son of Flubber. Rotten Tomatoes. Retrieved September 5, 2013. ^ Crowther, Bosley (February 9, 1963). "The Screen: Reinflation". The New York Times. 5. ^ "Film Reviews: Son of Flubber". Variety. January 16, 1963. 6. ^ Scheuer, Philip K. (January 13, 1963). "Pounds of Trouble, Tons of Slapstick Fun". Los Angeles Times. Calendar, p. 3. ^ "Son of Flubber". The Monthly Film Bulletin. 30 (351): 51. April 1963. This page was last edited on 24 April 2019, at 13:53 (UTC).